This Quick Start sets up a flexible, scalable Amazon Web Services (AWS) Cloud environment, and launches Bitbucket Data Center automatically into a configuration of your choice. Bitbucket Data Center is a Git repository management solution from Atlassian. It provides source code collaboration for enterprises that require high availability and performance at scale. This Quick Start uses the Atlassian Standard Infrastructure (ASI) as a foundation. You can also deploy Jira products and Confluence Data Center within the same ASI. In a private subnet, an Auto Scaling group with Bitbucket Data Center instances based on Amazon Linux. 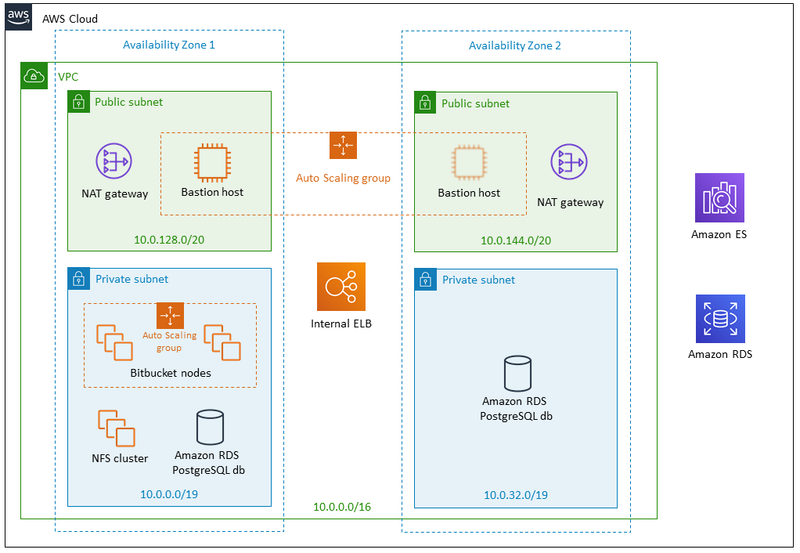 In the private subnets, Amazon Relational Database Service (Amazon RDS) PostgreSQL as the external database for Bitbucket Data Center. In a private subnet, a network file system (NFS) server instance. This provides a shared file system with an attached Amazon Elastic Block Store (Amazon EBS) volume for storing repositories. Amazon Elasticsearch Service (Amazon ES) for Elasticsearch 2.3 indexing and searching functionality. * If you're deploying Bitbucket into an existing Atlassian Standard Infrastructure (ASI), the Quick Start detects the components marked by asterisks, and provisions Bitbucket into your existing ASI. Configure Bitbucket Data Center for multiple nodes. To customize your deployment, you can choose different instance types for your resources, configure your cluster nodes, and adjust file server and database settings. This Quick Start requires a Bitbucket Data Center license. For information about obtaining a license, see the Atlassian pricing page. The Quick Start can't be used with Bitbucket Server licenses. If you want to evaluate Bitbucket Data Center, you can also request an evaluation license when you configure the product after deployment.